As Calgary’s culturehouse of live arts, Theatre Junction at the Grand Theatre is where people, ideas, and art forms converge to celebrate differences, open new possibilities, and move in new directions. 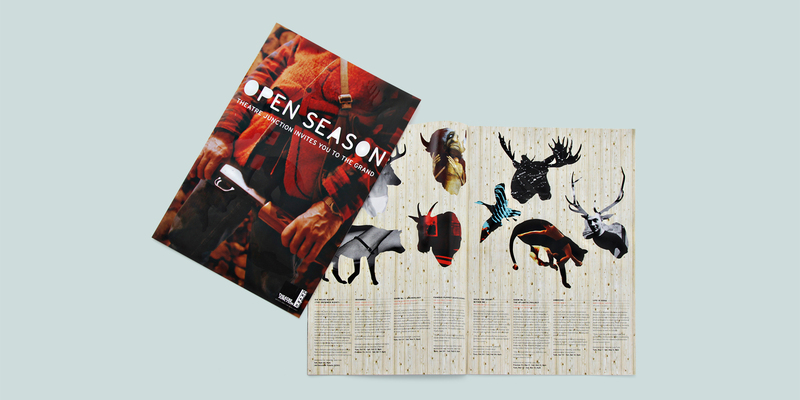 The goal of the Open Season campaign increase the exposure of the contemporary theatre to a wider audience. Capitalizing on the extreme, the campaign featured the contextually appropriate “hunter” to personify the furthest reaches of Theatre Junction’s typical target market. With construction on the Grand Theatre delayed, Theatre Junction was forced to open the doors regardless of the scaffolding surrounding the building. In order to regain street presence, an illustrated montage of vintage signs was created, printed on a giant tarp and wrapped the building, exclaiming that the Grand was open again. When building construction was complete, the tarp was re-appropriated into commemorative tote bags as a successful fundraising initiative. © 2019 Danielle Tuchelt. All rights reserved.